The publication of the Checklist of the Lepidoptera of the British Isles, D. J. L. Agassiz, S. D. Beavan and R. J. Heckford, in December 2013 (as ammended and updated) has introduced changes in the taxonomic order and a new numbering system. This website now reflects the new checklist order/numbers but, for the sake of continuity, the numbers from the Checklist of Lepidoptera Recorded from the British Isles, Second Edition (Revised), J. D. Bradley, 2000 have been retained in parenthesis. 1) Sophronia humerella has been removed from the British list with records considered doubtful. 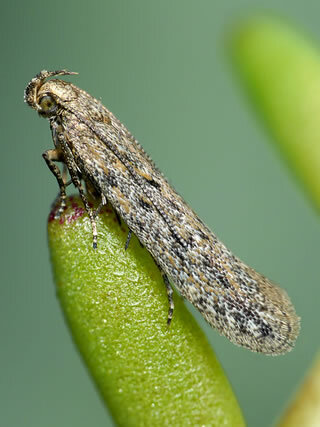 2) British records of Scrobipalpa salinella (now considered to be a Southern European species) are believed to refer to Scrobipalpa salicorniae (see Huemer, P. & Karsholt, O., 2010, Microlepidoptera of Europe 6: 180-182) and this name has been adopted. It should however be noted that the distinction between these two species still has to be confirmed by DNA studies. Bred specimens of S. salicorniae would be welcomed by the Scheme organisers to aid such research with full site, date and recorder information together with details of the food-plant utilised. 3) The genus Syncopacma has been synonymised with Aproaerema as from Feb. 2019. The provisional status of each species is taken from those proposed in Davis, A. M., A Review of the status of Microlepidoptera in Britain, Butterfly Conservation, Wareham, 2012 (Butterfly Conservation Report No. S12 - 02). The Distribution statement on this website is based on records received by the scheme and the national vice county distribution maps maintained by Dr. John Langmaid and Dr. Mark Young. Much of the information in this section has been primarily sourced from The Moths and Butterflies of Great Britain and Ireland Volume 4 (Part 2) and updated with more recently published papers, notes and books as well as comments included within the data submitted to the scheme. References abbreviated in this and other sections can be found on this site in the Publications section. Foodplants reported from Europe are taken from The Microlepidoptera of Europe series, Vol 3 - Gelechiidae I and Vol 6 - Gelechiidae II by P. Huemer and O. Karsholt, supplemented, for species not covered in those volumes, by Die Palpenmotten Mitteleuropas by G. Elsner, P. Huemer and Z. Tokar and more recently published papers. There are two distribution maps associated with each species, the Species Distribution Map (SDM) on the first page of each species and available for all species, and the Larval Foodplant Distribution Map - LFDM (in the Feeding section), where the larval foodplant in the British Isles is known and available. The SDMs will expand to display the level at which the record was made - ie 100m, 1km, 2km or 10km. Those made at a 10km level overlay other more accurate records within the square. The data supporting these maps is updated on an annual basis (usually in the Spring) and both maps are provided courtesy of the Centre for Ecology and Hydrology. These show, in a simplified format, the months in which the larva and imago can be found while more detailed information on flight periods can be found in the accompanying text.